Oh! What beautiful joy to have too much bacon in your life. As I get ready for a short trip, I felt compelled to use any bacon in the refrigerator so it wouldn't be wasted. But how is one to use a lot bacon quickly? What an awesome dilemma. This recipe was submitted by "kkeppler" in 2008. I got around to making today in December of 2012. I didn't change his recipe, except for one thing... I filled it with more bacon! Indulgent? Maybe. 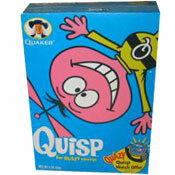 Delicious? Yes, my friends, it was amazing. In a large nonstick skillet over medium-high heat, cook the bacon until well-browned (about 6 minutes). Transfer bacon pieces to a paper towel and pour the excess bacon grease out of the pan. Return the pan to the stove top and reduce heat to medium. In a small bowl, combine all ingredients (including the cooked bacon) and beat until well-combined. Pour egg mixture into the skillet. 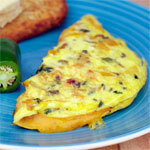 As the egg starts to set, lift the edges of the omelet to let uncooked egg flow beneath the omelet. When almost completely set, flip the omelet and cook for 30 more seconds. 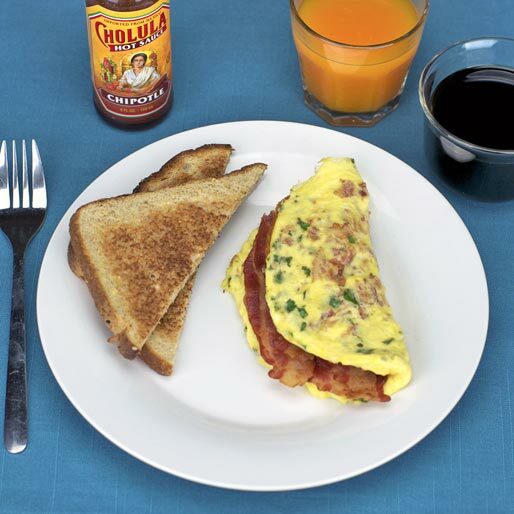 Fold the omelet and transfer to a serving plate. 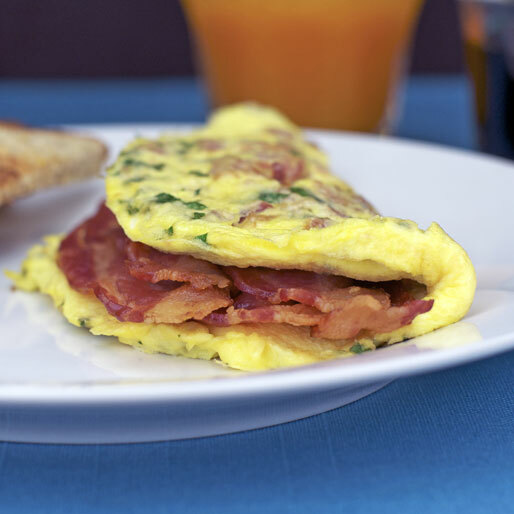 This is a very basic bacon omelet recipe. It's easy to modify. Try other seasonings. 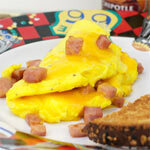 If you'd like to add cheese, just sprinkle shredded cheese over one half of the the omelet after you flip it. Then fold, cover the pan, turn off heat and allow omelet to set for one or two minutes so the cheese can melt. Delicious. Mr Breakfast would like to thank kkeppler for this recipe. 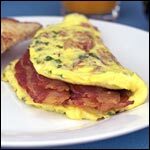 What do you think of Simple Bacon Omelet? 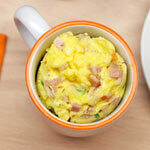 Amazing breakfast idea especially good with fussy children, for them no chives and they love it. Just made this. No cheese in the fridge unfortunately. But it was excellent. Needs lots of cheese... then perfect. One of the best breakfasts I've ever had! 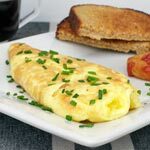 Brilliant omelette recipe - what a great way to use up my bacon before going on a field trip to Uganda, highly recommended! This omelet looks so good.... I could eat the picture! I added some extra cheese to it because I love cheese in my omelette but this one really didn't need it because it was really good already. Bring on the bacon! Love it. Just needs some cheese.